Yes, I know what you're thinking... "Ryan, why the heck are you reviewing a BOTTLE." Well here's the deal: Product reviews are often a dime a dozen when it comes to any new "hot" item (eg, an ipod or a laptop). So for the most part I wouldn't bother with a detailed review on those kinds of products. I saw these new Nalgene MultiDrink bottles and was going to order one, but there's relatively little information about them on the web at the current moment. Any "reviews" I've found were just a brief opinion combined with a stock photo of the bottle. 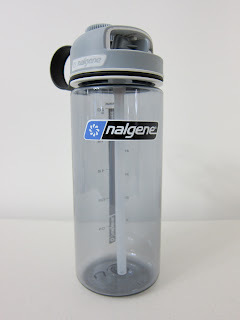 As of the time of this writing, the MultiDrink doesn't even appear on Nalgene's own website...so as a service for anyone considering purchase, I thought I'd post a review of the bottle w/ more detailed photos. Full disclosure: I've been a fan of Nalgene bottles for some time now. The wide mouth bottles are pretty standard equipment when backpacking, and I've been using the "On The Go" (OTG) bottles around the house for everyday water drinking and for biking since they fit in bike water bottle cages. They're quick and easy to open one handed, and the size of the opening gives a good flow of water, comparable to drinking from a standard disposable bottle of water. The problem with the OTG bottle lid is that it's not 'leakproof' as Nalgene would say. I've run into problems with this myself. Lying the bottle on its side or throwing it in a bag can cause a leak if there's even slight pressure on the side of the flip-top part of the cap. I've also had a few accidents that involved dropping a bottle where the flip-top popped open, flooding the floor (this is an awesome display in the middle of a college class by the way). So I was in the market for something with a different kind of cap for my excursions into the business and college world. The MultiDrink is a slightly stouter, shorter bottle than the OTG. I suspect this shape will still fit in most backpack pockets and car cup holders that aren't large enough to hold the large one liter wide mouth bottles. It still uses the same 63mm mouth and threads as the classic wide mouth and OTG bottles so the lids are interchangeable between the three (however, because of the MultiDrink's height, the internal part of the straw will only reach the bottom of the MultiDrink specific bottle). The MultiDrink lid features a flip out straw for 'sipping' and a smaller 24mm loop top cap for 'chugging' (according to the packaging). The straw mechanism seems to have enough friction that it would be difficult to pop open unintentionally, but just in case, there is a switch that locks the straw shut. Next to the fold out portion of the straw is a small one-way check valve whose purpose is to let air into the bottle while you drink. Stuff for the hippies and treehuggers: While the bottle itself is made in USA from the standard BPA-free Eastman Tritan copolymer that has become a Nalgene standard, the cap is made in China. Also, the shrink sleeve packaging is made from "EarthFirst PLA film" that is made from 100% renewable plant resources. In summary, I think Nalgene did a good thing. The lid offers the best of both worlds with a wide mouth opening which is good for cleaning or adding ice, and the smaller opening for drinking without spilling while riding in a bumpy car. (side note: the same benefits can be found in the Humangear CAPcap that fits Nalgene bottles.) For me, the fold out straw is more of a gimmick than an exercise in practicality...but I'm sure some will find it useful. I've posted some photos in my Flickr account if you'd like a closer look at the bottle. Ryan, I work at Nalgene, give me a call at 585.899.7254. Thanks, Eric.